I am a real purist at heart so this would be how I want my teams to play from the back. Ok its risky sometimes but to me we have to try it. We have to defeat the long ball from the keeper way of playing that to me is completely wrong to play. Using this method, what are we teaching the players? Boot it and hope you win the 2nd ball? Bad, sad and it makes me mad !! We owe it to the players to teach them this as Young as is possible. So here we develop play from the back. I work on this initially practicing all ways to get out. Basically we do it with (4), (5) and (6) as the first three, (8) is the single player, (2), (3) and (10) the next line of three and finally (7), (9) and (11) as the front three. 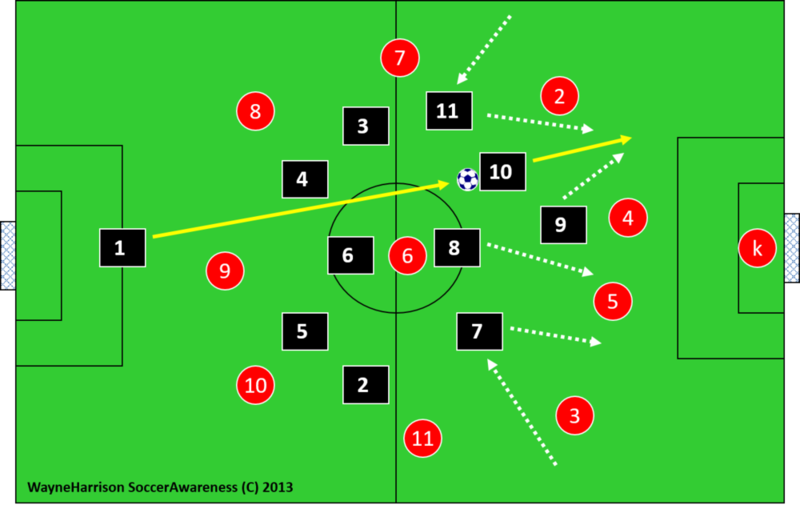 But players rotate within this system to create a distinctive angled possession STYLE within the system / formation. Perhaps use cones instead of actual players to practice to make it work initially and to gain confidence (better still use Mannequins). Attacking team work the ball to the coach and then work it back to the keeper, back and forth. Our starting position, the team is in defensive shape and ready to attack. A 7 v 4 makes it easy to get out, but decrease the number of opponents if necessary to gain success initially; or increase if too easy. Our team building from the back get wide and long. We maintain possession passing up and down and can go back to the keeper and constantly start again; or give it to the coach. Coach gives it to the attacking red team and the defending team (your team) must get back to defensive shape asap. Add more players if this is too easy to defend against. 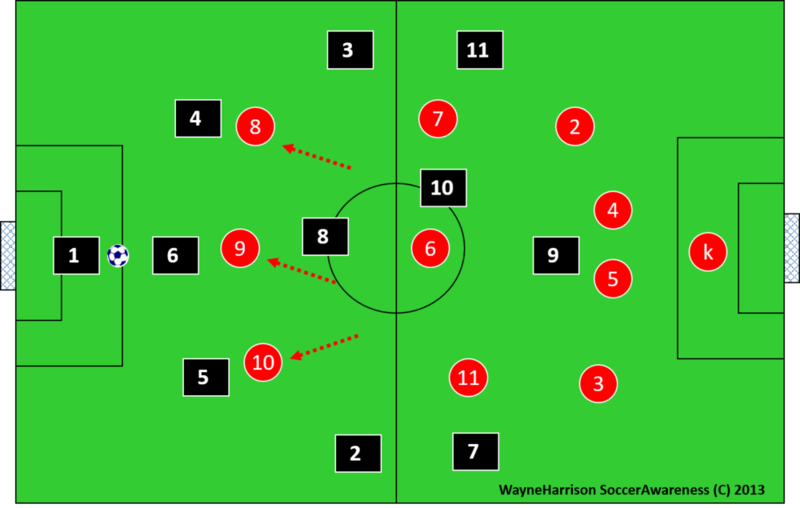 A simple starting position on distribution from the back using only those players in the immediate vacinity. A 3 v 2 at the back in our favor. Now (6) breaks wide to receive the ball and escape being marked in the middle and switches with (4) and perhaps opponent (9) goes with (4). 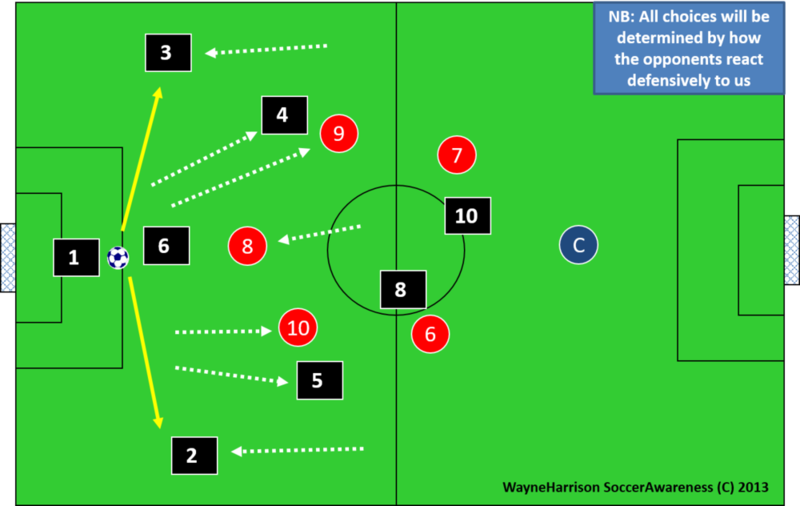 The same can happen with (6) breaking out to the right also replacing (5) who moves centrally. (4) Stays tight, (6) stays central, (5) goes wide, (2) pushes on and we get out down one side. Opponents (9) and (10) stop our (6) and (4), (5) gets free to play out. Only 2 defending now so risky against a counter attack. OR, (3) stays tight too (4) moves central, (6) takes (5)s place at the back, (5) goes wide, (2) pushes on and we get out down one side. Opponents (9) and (10) stop our (6) and (4), (5) gets free to play out. (2) becomes (7), (5) becomes (2). Three defending now. They push 3 up we get out through our wingbacks. Have opponents make different choices to force the keeper to make relevant decisions in training. We can start to add players and build the session up. Here we close off one side so the keeper has to recognize he cant go to (3) but can go to (2). 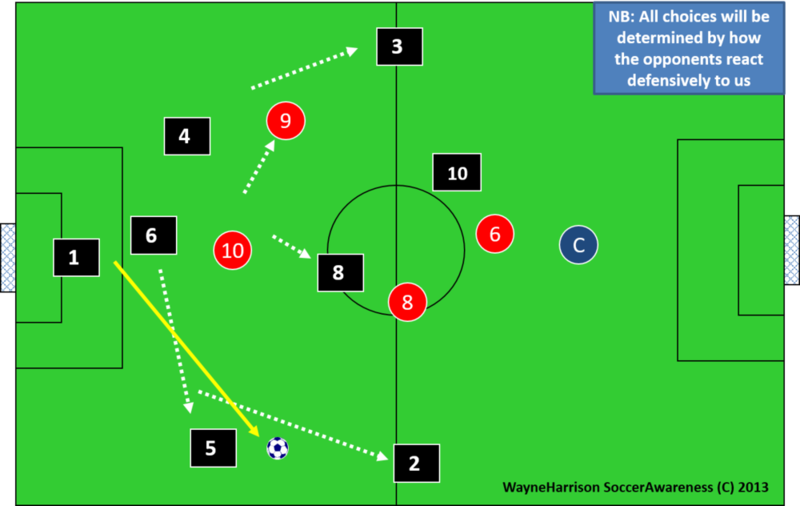 (6) Clears the space and takes the opponents (8) with him and our (8) drops in free to start the attack. Can also be with (6) and (10). Centre backs both push out quickly,. And they are tracked by the two strikers. This releases spaces behind them. Both wing backs drop back into those spaces to receive the ball. Centre backs both push out quickly,. Opponent strikers press the wing backs and centre backs get free so can bring the ball out and attack. 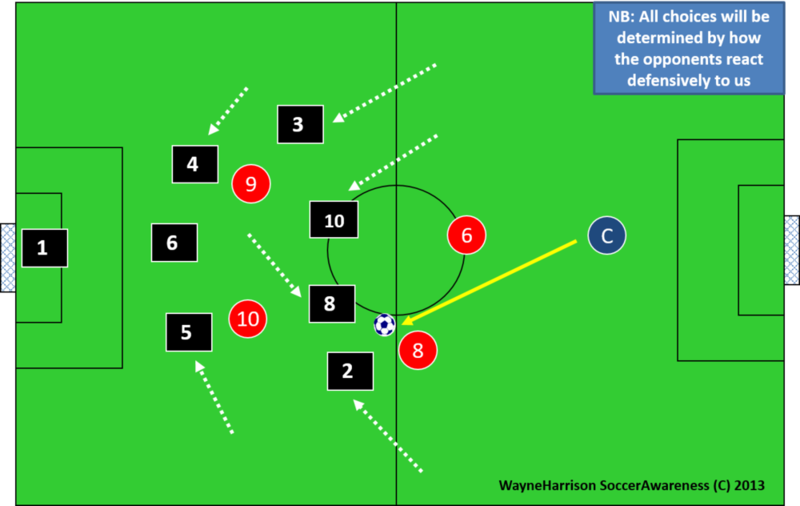 Wing backs fill their positions by rotation. 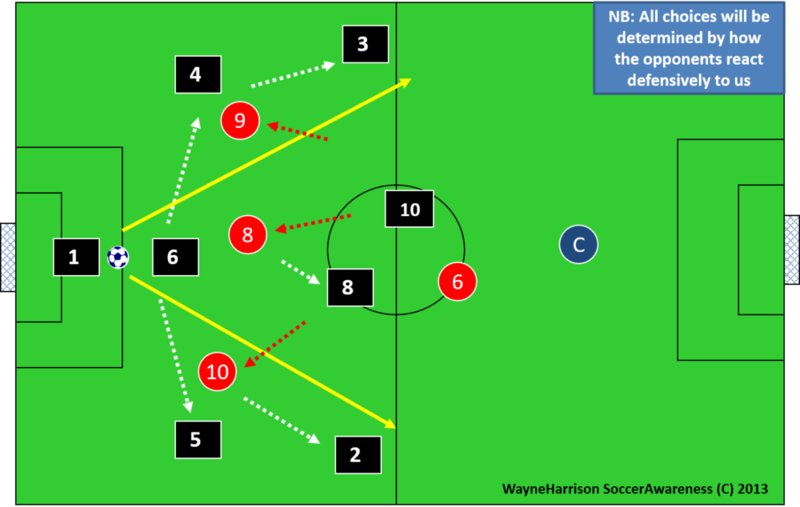 (2) and (3) become centre backs and tuck in either side of (6). Also (6) and (8) tried to rotate to get out. 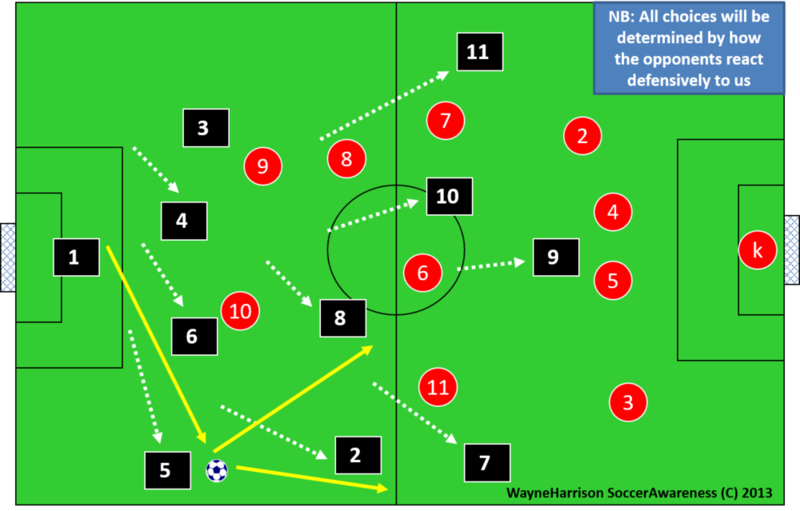 We tried (6) and (8) rotation, also center backs and wingbacks rotated, then we lost the ball and this is how we recover with players in different positions but in the same defensive framework. Now in an 11 v 11. Our normal way to get out from the back. We should always try this initially if it is on to do so. Try to get out thru (4), (5) or (6). 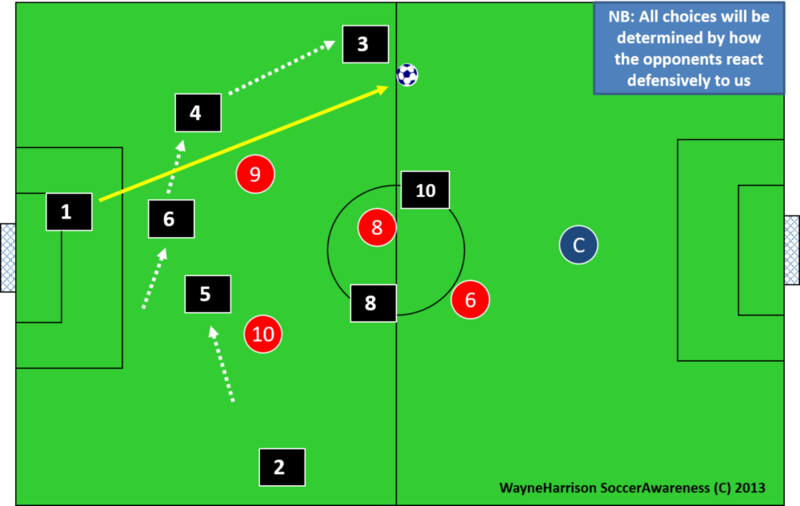 Another way to get out thru one center back (5) and (7). Wingback (2) tucks inside and may take opponents 11 with them to clear the pass for (7). A nice area to play into circled also. They go 3 v 3 against us to stop us playing out of the back so we try to get out through (2) and (3). Otherwise we have to push up, condense and kick it long. This takes lots of practice with the keepers to make this pass happen consistently. They go 3 v 3 against us so we try to get out through (2) and (3). Otherwise we have to push up, condense and kick it long. 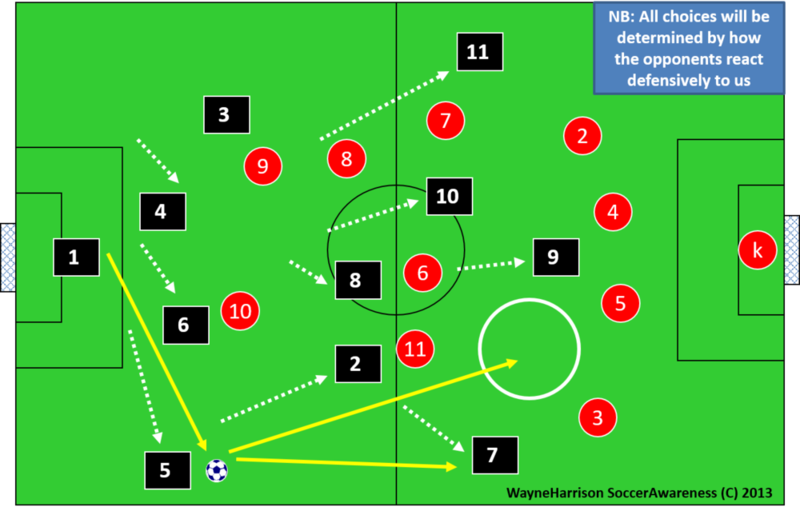 They “may” see what we are doing and push 7 and 11 onto our wingbacks (2) and (3). This outlet is now stopped. So we have to change our team shape from “wide and long” to “short and tight” getting ready for the long kick from the keeper. This can still be EFFECTIVE: Now we condense as a team “short and tight”. Our (10) is good in the air so we hit him and we have a lot of players around him to win the 2nd ball. Of course opponents will readjust also. Its cat and mouse. We leave their 3 strikers offside. Players can gamble for the flick on from (10). Players position behind, in front and alongside (10) so wherever the 2nd ball goes we have players to pick it up. WE ABSOLUTELY MUST get better at this. Obviously opponents will position better than this defensively; but you get the point.